While there have been some conflicting reports in this area, it is clear that moderate use of cayenne is cancer protective and can help you reduce your toxicity naturally. However, excessive use of chili may be counterproductive. In one study of Mexicans who ate lots of hot chilis, there was a noticeable increase in the incidence of stomach cancer. To test the theory that capsaicin causes cancer, scientists painted capsaicin on the backs of shaved animals, then applied one of the most potent cancer-causing agents known (DMBA from tobacco smoke) to the skin, with a result of no tumors formed. Other researchers found that cayenne used regularly lowers the incidence of cancer and seems to block the downhill spiral of initiation and promotion that begins cancer. Now, there is an entire series of scientific articles showing that capsaicin prevents the cancer that would have formed from exposure to benzopyrenes (found in overcooked foods), aflatoxin (found in moldy grains and legumes), and tobacco nitrosamines. This can lower your risk of cancer. 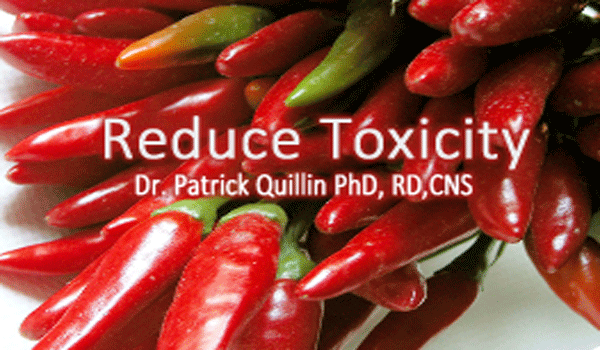 The conclusions from researchers who are very savvy on foods and cancer: “Although a minute amount of capsaicin displays few or no deleterious effects, heavy ingestion of the compound has been associated with necrosis (death of tissue), ulceration and even carcinogenesis.” In other words, if a little hot chilis is good, then more is not better. The liver is one of the largest and, arguably, the most sophisticated organ in the human body. It converts, stores, processes and detoxifies millions of molecules a minute. When the liver develops fatty accumulation, all of the vital functions in the liver slow down. Due to its lipotropic action (means “breaking up fats), cayenne may be able to help prevent the collection of fats in the liver. Cayenne Pepper has a vast number of healing properties. Cayenne may also reduce the toxic effects of alcohol, which can cause fatty liver, and possibly worse (fibrosis, necrosis). Cayenne Pepper is a ‘wonder medicine’ that has many healing properties. Foxes in the Arctic started chewing through important scientific cables. The researchers found that spreading cayenne powder over slightly tacky silicone sealant that was applied to the cables was able to stop the foraging foxes from this costly habit. Other gardeners have found that cayenne can keep out many rabbits, raccoons, deer, insects and other pests. However, birds seem unaffected by the pungency of cayenne. Other animals have developed a penchant for cayenne. Cayenne is an inexpensive and non-toxic pesticide, but I wouldn’t “bet the farm on it” as a universal pesticide agent. Cayenne helps to encourage sweating. The skin is the largest organ in the human body, with about 2000 pores per square inch of surface area. A main function of the skin is to eliminate waste products. You may recall a James Bond film called Gold Finger, in which a young woman model was sprayed completely over with gold paint–and died from having her pores closed up and unable to detoxify. Cayenne encourages sweating and detoxification, which is an extremely important function in toxically burdened Americans.